Comments on the first four lines of the poem Atchafalaya Is have appeared earlier in Riverlogue postings – now for the fifth line. I guess any place can be a place of memories, but some places seem to stand out more than others in latent memory-potential. These places offer abundant opportunities for things to happen, things that do whatever needs to be done to the right neurons to cause the memories to be stored in the safe deposit boxes of our life’s recollections. We tend to like good memories more than bad ones, or happy ones rather than sad ones, but either way it is the significance of the memory that stirs us to recall the times and places of the past. If we are standing near the door to a moment-of-awakening, when the door opens we can absorb that moment and then use it to build a stairway to the next door. If we are fortunate, we pass through many of these doors in our lifetime. The Atchafalaya Basin is one of those places where there are doors opening all the time for those who recognize them. The fifth line above includes everybody. It would be a dull person indeed who could enter the Basin and not come out of it with some memory – good or bad. When you think of the true scope of the “everybody”, literally every body, the broadness of the thought is overwhelming. So, to reduce the concept to something we can handle, perhaps personal memories are sufficient for illustration. The earliest memory of the Basin stored in my personal storehouse comes back as a picture of cypress trees at the edge of Grand Lake. Not the huge, tall, thin, straight trees of the past, but the smaller gnarled and twisted ones growing perpetually in the water at the edge of the lake. These forty-foot trees looked out of place to me, and that may have been the key that unlocked the safe deposit box. The trees were growing in the water – they should have been on land, but no. Why don’t they drown? The door opened and the memory stored away in the box, to be recalled at moments like this one. Narrowing still more the range of recollection to a single area of Basin memorabilia is probably the only way to deal with these thoughts in the limited format of this web log. The two pictures included here can serve as focal points, perhaps. They are pictures of a model houseboat-dwelling in the Basin in the 1930s. I wasn’t here then, of course, but so many people have generously shared their memories with me that I feel very at-ease with this picture. 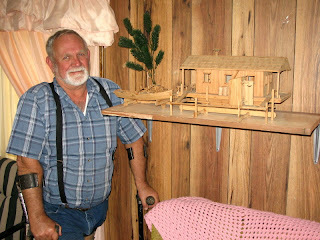 Billy, who built the model from the memories of Dot Couvillier, is the fellow in the pic. The other image shows more detail. It should be realized that this scene includes the complete domestic environment for a houseboat family. First, the houseboat is tied to the bank by ropes to the posts on the very slim wharf. Sometimes there was no wharf and the gangplanks rested on the bank. The outhouse is shown on the wharf but would have been further out in the woods. The re are two main components to this arrangement, the houseboat and the “crib” behind it. The crib was a raft made of cottonwood logs (which are always used for this), about thirty feet long. It was 12 to 16 feet wide, usually. The crib would have been the yard, if this house was on land. When the water rose the three or four feet in the spring that it usually did before the big levees were built, it would cover the natural bayou levees that bordered the hundreds of miles of bayous in the swamp. These levees and the low swamp behind them were where the chickens and pigs lived most of the year. When the water rose the livestock was confined to the crib until the water receded. Someone asked me the other day how the animals were prevented from jumping off of the crib, I don’t know. 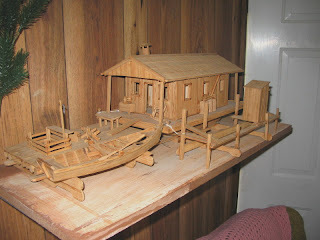 The crib was also the permanent place where the “fish cars”, the wooden slat-boxes used to keep fish alive, were placed. They nested down between the logs and fish lived in them until the fish boats arrived twice a week to buy the fish. The model shows a worktable and an enclosure that a toddler might be kept in. The boat is a push skiff. You stood up in it and the long oars were pushed forward to propel the boat. Before outboards were invented, this was the primary way you got around the Basin. It took a long time to get very far, and at a cost of a lot of energy. No wonder most of the folks who did this didn’t have much of a problem with being overweight. Some of the people who remember the old push skiffs still say it was a better way to get around than the motorized way. You had to go to your lines, run and bait them, and come back with your fish still alive in the wellbox of the boat, so time was also limited by how long the fish would live. My friend Edward is reproducing this skiff from one that was built in 1939. Could be he will display it at the New Orleans Jazz and Heritage Festival next year, I hope so. I try to picture the house we live in now in comparison to the houseboat. Our house is not a big one by today’s standard requirements – about 2000 square feet under the main roof. But, compared to the houseboat, wow. The floating structure would have been about 360 square feet under roof, divided into three rooms of equal size, one kitchen and two bedrooms. As you can see, there were windows in each room and a door at each end. The windows had no glass, of course, and most of the time no screens. Drinking water was caught in rain barrels on the side of the houseboat; wash water, after being taken from the bayou, was treated with alum to settle the silt. Picture all the activities that need to go on in a family taking place in a 360 square foot space. Picture the family progressing from newlyweds to eight or nine children, all in the same space. Where would they eat? Where would they play? Where would they…? And most of the time, none of them could swim. Accidents did happen, sometimes with terrible consequences, but you don’t hear many people saying that. Once in a while, a child would fall overboard, or jump while being chased by an irate parent with a frying pan, but they were almost always pulled out unhurt. This was probably one of benefits of having six or eight siblings. Would the benefits of family closeness outweigh the lack of personal space? Some say yes, some say not so much. But you do hear a lot of good memories coming from the children of the Basin houseboat dwellers. You do hear from a lot of people who were standing next to the doors of opportunity and learning when the doors opened to invite them in. And these are just a few of the myriad people who regard the Atchafalaya Basin as an open door to that place of memories. I guess the trick is to be ready to walk through when the door opens. The river is at 9.2 feet on the Butte La Rose gauge, falling hard to 6.7 feet by Sunday. The Ohio and Mississippi have nothing in their watersheds to support any kind of rise in the near future, and that’s pretty much as it should be for this part of the river cycle. We should proceed now toward the low water extreme of the cycle. Because the water stayed up a good while, the crawfishermen have had a longer than usual wild crawfish season, though not long enough for some of them I’m sure. But some will have time now to buy a new truck, maybe a new motor, and bet on a few local baseball games. Last night and today it rained about four inches over here. Coming home last night about 9:30 it was easy to hear that the rain had been noticed by beings wired to respond to it. The sound coming from the ditches and the borrow pit in front of our house was immense – if you can use that word to describe sound. 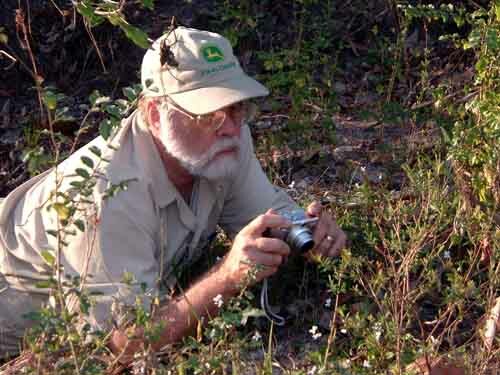 Everything that was supposed to engage in reproduction in response to rain was trying to yell louder or better than its neighbor in competition for the favor of a female. Frogs, insects and even some owls were singing so loudly that when you stopped and just stood still it was impossible to pay attention to anything else. You can feel small in a situation like that. You can know that there is a world of non-humans living next to us that doesn’t relate to us in any way, or care to. I guess that’s why it’s easy to feel unimportant standing next to that world. But you do feel lucky. Lucky to have the chance to hear these choruses, lucky to know enough to stop and listen to them. Appreciation comes without effort, the night belongs to them. The river is at 11.1 feet on the Butte La Rose gauge, falling to 10.2 feet over the next few days. The Mississippi and Ohio are not doing anything dramatic so we should stay about the same for the next ten days. Sunset over the river a few days ago. For a very long time I have been thinking that, in a search for information, the question is more important than the answer. Without the right question, you have no possible chance of a right answer. This morning I was down at the river with my grandchild Elena, aged two. We were practicing taking river shrimp out of the traps and placing them carefully back into the water. This practice will not get your trotlines baited, but it sure is satisfying watching Elena reach in and handle the shrimp (which she called crawfish) without fear. The trap had five eels too, which we liberated unharmed. At a certain point I glanced over at Elena who seemed to be somewhat preoccupied for the moment and paying a little less attention to the shrimp. She was looking at the water flowing past the dock, carrying small bits of debris from north to south. Then I heard her say “Where river go?” in her small voice. It took me a moment to realize what she meant. I pointed to the water moving past us at a steady if unhurried pace and asked “Do you mean the water?”. She answered with “Yep”. Now, she had assessed that in the setting of the moment there was herself, me, the dock, shrimp, and water, and it was the water that was moving – not the dock. So, where river go, she wonders. It took me a moment to select an answer from the many possibilities. I just said “It goes very far away”, and that seemed to satisfy her. At least it satisfied her until the next answer becomes appropriate, the one that her increasing age will need. Another big question, if not exactly a philosophical one – how do people come up with the collective names for animals grouped together. Like, a herd of cows, or, a covey of quail. 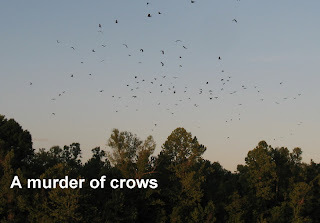 Yesterday afternoon there was a “murder” of crows at the river, known as a “storytelling” by some. I guess to some people they can seem to be murderous when robbing nests for eggs or nestlings, and this group was loud enough to be storytelling about the day’s comings and goings before roosting for the night. Crows are interesting, probably because we identify with them in both their genteel and not so genteel habits. The river is at 10.4 feet on the Butte La Rose gauge, rising slightly to 11.2 feet by Monday. The Mississippi is rising a small amount but the Ohio isn’t, it is falling. This is a good example of how little the Missouri River influences the main Mississippi channel. With all the talk the last few days about the flooding on the Missouri, you would think we would be in for some high water down here. Not so, as long as the Ohio stays out of it.